Leave NYNY out the exit by the Zumanity Theatre and take some pictures there with the Zumanity props. It's fun. This exit will lead you right into The Park. Here you can grab a beer, stroll along the pathway, see the "Dancing Lady" statue, and even play a giant game of Jenga. The weather at night is beautiful in Vegas so take your time and enjoy. Leave The Park by walking into the casino Park MGM, which was once the Monte Carlo. 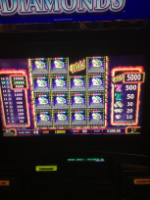 On a Wednesday night, the casino floor will be fairly quiet compared to the weekend so this is a great opportunity to walk around and gamble. Slots and table games will be less crowded on a Wednesday. Inside Park MGM you can walk to the tram and take this (for free) to Crystals, Aria, and the Bellagio. Since this is your first of three nights, don't delay in seeing the famous Bellagio Fountains. Take the tram to the Bellagio and enjoy the marvel of this hotel and the fountains. Tonight is your best option to really enjoy the fountains before the weekend crowds. I've watched the fountains four rows deep on a Friday night. After watching the fountains, the jet lag might be starting to set in. We like to get up early so we do not stay up too late. For us, one am is three am east coast time. For those who like to stay up all night, there are numerous late night menus and reverse happy hours. Of course, there are plenty of drinks and casino games too. There are night clubs everywhere in Vegas (and whatever else you might imagine in the middle of the night). There is Aria and The Cosmopolitan close by and they are amazing, fun casinos. If you're in the Cosmo, look for the purple chandelier and have a drink at one of the bars or go to Henry's for a late night meal. For people like us, this is where we stroll back to the hotel stopping at a CVS or Walgreens for snacks and waters. Before bringing the night to a close, take a selfie at the famous red high heel in the Cosmo. Day one is coming to a close and what better way to spend the day than in Vegas. First FULL day in Vegas. Grab breakfast at Mon Ami Gabi at the Paris Hotel or try The Avenue Cafe at the MGM Grand Hotel. Both are delicious, but Mon Ami Gabi is well known for the amazing people watching. Ask for a table outside. The Avenue Cafe is more our style for food, but I do love people watching. Both offer gluten free options. If you're at Mon Ami Gabi, here's your change to go to the top of the Eiffel Tower. A day trip to the top is cheaper than night. We enjoyed the views during the day and honestly I don't think there could be a bad time of day to go. After eating and taking pictures, you might be wondering what's next?! 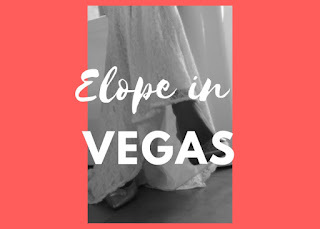 From Paris, take a right and walk in and around Bally's, Harrah's, and the Linq's. There are street performers, show girls, and plenty of people watching. There's shopping and restaurants and, of course, plenty of options for some adult beverages including at Carnival Court which is famous for the bottle-tossing bartenders and live bands. Before the day gets away from you, book a show. Carrot Top is an amazing comedian at the Luxor. He's reasonably prices and I've been four times. You will cry from laughing so hard. The last time I saw this show the woman next to me told me she would share her tissues with me. When I asked why the tissues she said "For when you're laughing and crying at the same time!" This was her 12th time seeing him. Amazing. Today take the bus or walk to Planet Hollywood and grab a cheap, hangover breakfast at Blondie's or Earl's Sandwich. While here, buy tickets to one of the shows at Planet Hollywood. They are fairly inexpensive and some are during the day and some at night. The V Variety show is good. Before you leave, check out the craps table. Planet Hollywood has $5 tables early in the morning even on a Friday. The music is classic rock and the dealers are friendly, kind, and down-to-earth. I've played here for hours and hours. When your luck runs out, or you are ready to move on, leave PH to the street and walk towards the Venetian. At the Venetian, take pictures. This place is gorgeous. Ride on a gondola, visit the wax museum, play in the casino. There's food and shopping and The Palazzo is connected to the Venetian for more food, shopping, and gambling. If you find yourself hungry here, go to The Grand Lux Cafe. Great food, not expensive, gluten free options, and you can do some more people watching. If you still have time before your show, walk over to the Mirage. This is a fun atmosphere and we have fun here playing slots, black jack, craps, and drinking pina coladas. There are comedians here on a rotating schedule and there is Terry Fator, all worth checking out. Saturday is an expensive day on the strip so a great day to rent a car and leave for a few hours. 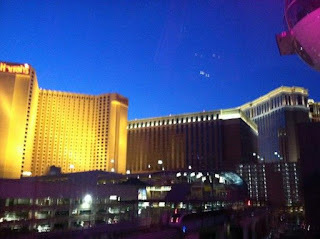 Renting a car is easy; there are rental places in almost every hotel as well as a few on the strip. Take a day trip to the Hoover Dam, The Valley of Fire, Red Rock Canyon. or Mary Jane Falls. Or go check out the old route 66, Boulder City, and stop in a random place for some great food and local shopping. We love our adventures off the strip. Come back Saturday in time to see a show? Splurge and see a Cirque du Soleil show like O or Ka. The best way to decide is watch a few youtube videos and see which one seems the one you want to see. Leaving Sunday? Check out from your room, leave a tip for the cleaning lady, and start planning your next visit on your flight home. Disclaimer: The thoughts and opinions on this blog are entirely my own. I would never have entertained the idea of seeing Carrot Top, but after reading your write-up I'll make sure to see his show. When we met a couple at another show and they told us to see him, we were skeptical too. He is really so funny!